While TV Land strives to get “edgier,” NBC seems intent on becoming the new TV Land with its latest dated sitcom. The Peacock’s Mr. Robinson takes a broad, punch-in-the-face punchline approach and drenches it with an oft-unwarranted laugh track. It’s the increasingly old-fashioned “multi-cam” format as opposed to “single-cam” shows that generally are subtler in tone and without canned or studio audience guffaws. TV Land lately has gone that route with its new trio of Younger, The Jim Gaffigan Show and Impastor. Craig Robinson, who plays Craig Robinson in Mr. Robinson, has known the glory of NBC’s single-cam The Office. In this reworked and recast version of the original Mr. Robinson pilot (which co-starred Jean Smart among others), he’s still the lead singer and keyboardist of a funk bar band called Nasty Delicious. Robinson’s also been subbing as a music teacher on the side, which ends up being the main focus of this six-episode, set-in-Chicago series. Filling in at Studs Terkel High School in hopes of rekindling a dashed romance with English teacher Victoria Wavers (Meagan Good), Craig very predictably encounters a batch of wacky co-teachers and an abrasive principal named Christine Taylor (Frasier alum Peri Gilpin in place of Smart). “In my class, we don’t just listen to music. We make music,” Craig tells his mostly pliable class before coaxing a quartet of kids to participate. Doofus physical education teacher Jimmy Hooper (Ben Koldyke), who dubs himself “Magnum P.E.,” is in constant full strut while Indian colleague Samir (Asif Ali) keeps trying to invent something to make him rich (such as “substitute beef” in Episode 2). Another teacher, Ashleigh Fellows (Kelsey Grammer’s daughter, Spencer Grammer), moonlights as a pole dancer. There’s also goofy school supervisor Dalton (Tim Bagley). For some reason he’s super-impressed with Craig’s band, which also includes his ambitious but awkward younger brother Ben (Brandon T. Jackson). NBC initially planned to pair Mr. Robinson on Wednesday nights with another broad multi-cam comedy, The Carmichael Show. But each series now will get three weeks worth of back-to-back episodes, with Carmichael Show kicking in on Aug. 26th instead of the 5th. The second Mr. Robinson episode, subtitled “Flesh For Fantasy,” is an altogether dreadful followup to the mediocre premiere. Gary Cole guests as burned out British rocker Neville Rex, who has a string of hits in his past and a community service requirement in his future. So Craig invites him to speak to his class, prompting a reunion between Neville and Principal Taylor, known as “Tight Fit” during her days as a rock band hanger-on. “I know every inch of this vixen. Outside and three inches in,” Neville crows. That kind of writing merits a lifetime of community service. Craig again ends up in a situation where he can either do the right thing or act in his own self-interest. Gee, wonder which path he’ll take. 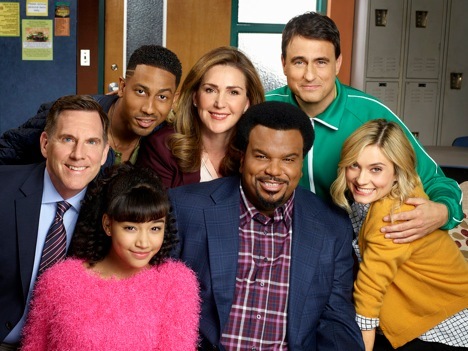 Mr. Robinson has an appealing star in Craig Robinson, but the show itself is gratingly forced and formulaic. NBC may think it can go back to the future and still regale present-day audiences. But the network’s Diff’rent Strokes/Facts of Life hit parade is long past high-stepping.